I stood at the blackboard that had been there since the school was built in 1911. Black slate. It was the first day of school and hot sunlight streamed through the large open windows that lined two walls in my corner classroom. I stood before first graders who did not know how to read. This was not unusual back then, and it was certainly not cause for alarm. This was before kindergarten was the new first grade. This was way back when first grade was the new first grade. I told them that they did not need to be nervous about learning how to read, I was going to teach them. And not to worry, because I was an expert. 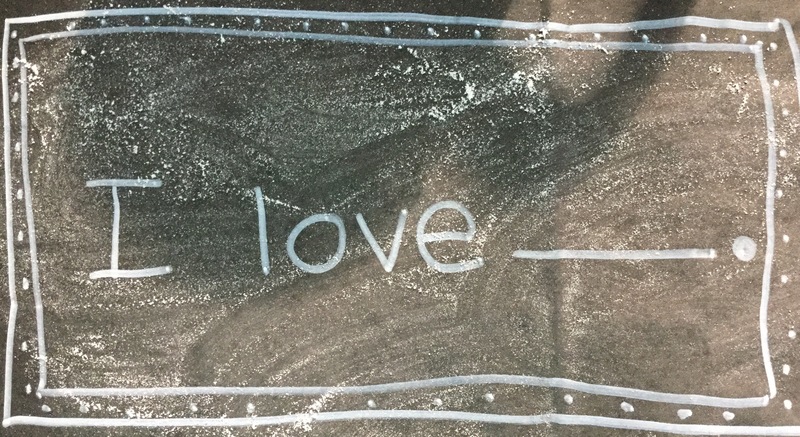 I began that first reading lesson with two words that many of them already knew: I love…. I asked them to write those words and then, when they were ready, to draw a picture of one thing they loved. Reading is more than hard work–it’s heart work– and this is where we began. The third word would be theirs. Meaning and connection would result in letters that spilled upon the page from the tip of my pen…and they would have a new word that was theirs to keep. I moved around the room connecting with each child as they shared what they loved most in the world, and in return I gave them the word they needed to begin to write their life. And then I got to Sam. He looked up at me with a shy smile. His glasses pushed back and slightly crooked on the bridge of his nose, a sign of his hard work and concentration. I looked at his paper and was awed. I knelt down for a closer look at the scrolls he had drawn with his yellow, brown, and black crayons. “Oh, Sam,” I whispered. “What a beautiful word to choose… I love Torah, too.” I wrote the letters carefully. Reverently. Intentionally. T-O-R-A-H. I stayed for a few extra seconds, not wanting to rush what had just happened. She and I remembered that story together years later at his Bar Mitzvah, when Sam honored me by asking me to read a poem about the sacredness of reading. I teach third grade now, but I am still in the same classroom. The slate blackboards have been covered by slick white boards and the room is now air conditioned. Sunlight still spills across the room and I often think about kneeling beside Sam’s desk. The memory is a reminder that there are holy moments in teaching. And we never see them coming.